The Duchess of Cambridge revealed a tiny baby bump tonight as she made her first public appearance since announcing her pregnancy last month. 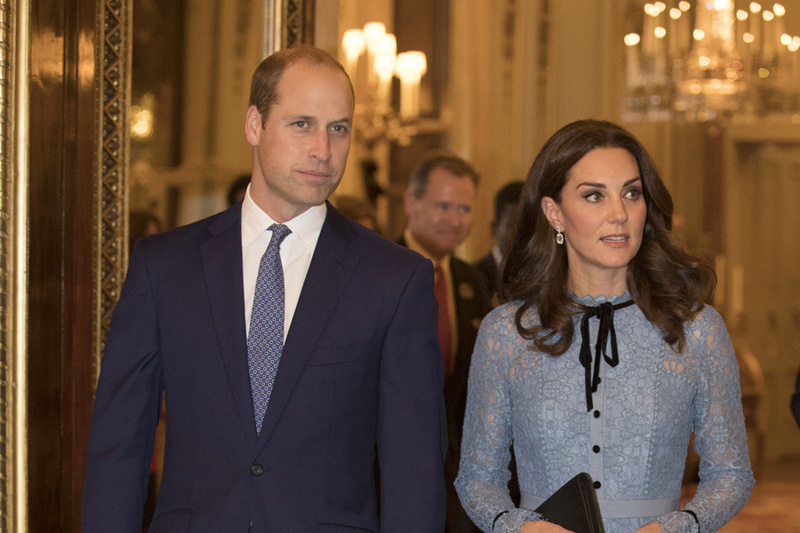 The 35-year-old royal joined Prince William and Prince Harry to host a glittering Buckingham Palace reception to mark World Mental Health Day. She looked radiant in a powder blue lace dress which skimmed over her bump. Kate has taken six weeks off royal duties after being struck down with the same severe strand of morning sickness that she suffered while pregnant with Prince George and Princess Charlotte. It forced Kensington Palace to announce her pregnancy far earlier than planned. An aide revealed that the duchess is still suffering from hyperemesis gravidarum but said her condition is improving. She added Kate was determined to attend the event because the cause is close to her heart. The event tonight is being held to mark World Mental Health Day - will recognise the progress, hard work and dedication of those determined to raise awareness of mental health issues over many years. William, Kate and Harry have supported the campaign that has been encouraging people to speak out about their psychological problems or be a sympathetic ear for others. The young royals also said they wanted to thank those from the sector for the support they provide to so many going through difficult times in their lives.